Could a centuries-old manuscript hold the key to finding solace in today's terror-stricken world? When Jessica wakes up in a French hospital on the day after the Paris attacks, she can't imagine a life unmarred by terror. Though she's flown to Europe to join her friends on an antiquing road trip to southern France, all she wants in the aftermath of the assault is to return home to Colorado. But her friend Patrick will not let her surrender to the fear. Worn down by his dogged and perplexing insistence, she reluctantly agrees to a modified trip. They stop for a few days in the village of Gatigny, where Grant and Mona welcome them into their B&B. After buying an antique sewing box at a nearby flea market, Jessica finds a handwritten document and a page from a Huguenot Bible concealed in its hidden compartment. As Grant helps her to translate the archaic French, they uncover the story of Adeline Baillard, a young woman who lived in the village centuries before. Frustrated by Adeline's story's abrupt ending, Jessica follows its clues from France to England, learning along the way about brokenness, resilience, and hope. 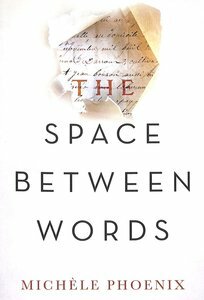 About "The Space Between Words"